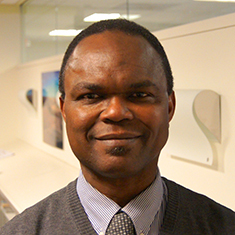 Dr. Sambe Duale serves as a Senior One Health Technical Advisor for the Preparedness and Response Project, a component of the U.S. Agency for International Development (USAID) Emerging Pandemic Threats 2 Program. He joined the RESPOND Project in 2014 as the Technical Lead for the Ebola Virus Disease preparedness and response for the at-risk countries in Central and West Africa. Sambe has more than 35 years of progressive public health experience and his skills encompass policy dialogue and advocacy, research and analysis, evidence-based policy development, program design and implementation, and evaluation. Sambe works across a range of technical areas, including maternal and child health, infectious disease surveillance and outbreak response, and health systems research. He is very familiar with public health issues in Africa, including those in fragile states such as his native Democratic Republic of Congo (formerly Republic of Zaire).